Government Adda 247 Bank Job Federal bank Recruitment for Officer scale I and Clerk[मुदतवाढ]. 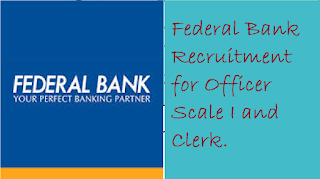 Federal bank Recruitment for Officer scale I and Clerk[मुदतवाढ]. 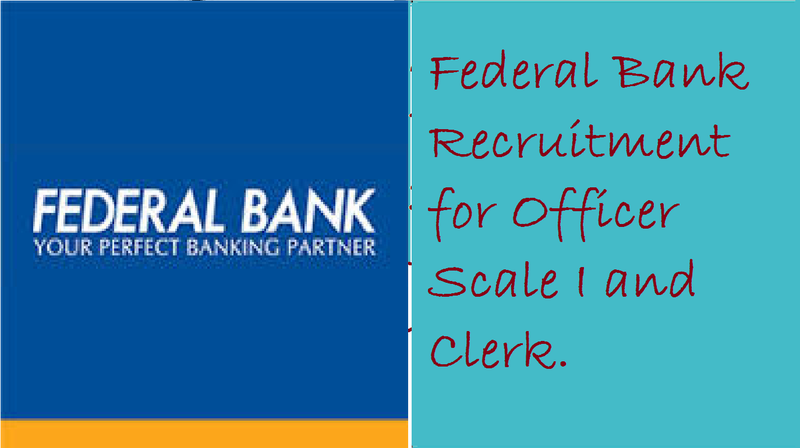 Federal Bank Recruitment for Officer Scale I and Clerk. The federal bank has released the notification for the posts of Officer Scale I and Clerk as per the notification number HR-TAD/Rec/Adv/2018-19. The federal bank has not revealed the total number of posts. The bank aspirants who want to become a banker have a great opportunity to grab it. Those students who fulfil the criteria can fill the form from 14 August 2018 to 27 August 2018(which extended to 31 August 2018). The process for filling form is online and can fill by clicking the link which has given below. The last date for submission of online form is 31 August 2018. शैक्षणिक आहार्ता : अधिकारी स्केल I : किसी मान्यता प्राप्त विश्वविद्यालय से किसी भी विषय में न्यूनतम 60% अंकों के साथ पोस्ट ग्रजुएशन , क्लर्क : किसी मान्यता प्राप्त विश्वविद्यालय से किसी भी विषय में न्यूनतम 60% अंकों के साथ ग्रजुएशन/पोस्ट ग्रजुएशन. 1 अधिकारी स्केल I पद के लिये छात्र अधिकतम: 26 वर्ष, यानी एक उम्मीदवार का जन्म 01.07.1992 के बाद हुआ होणा चाहिये. 2 क्लर्क पद के लिये छात्र अधिकतम: 24 वर्ष, यानी एक उम्मीदवार का जन्म 01.07.1984 के बाद हुआ होणा चाहिये. 1. To submit applications on the web, sign on to Bank's site www.federalbank.co.in, take after the connection 'Vocations', click 'Current Openings' tab and tap the connection 'Enrollment Process 2018 - 19'. Read the qualification criteria and the guidelines precisely. Presently tap on 'Apply Presently' catch facilitated beneath the connection 'Enlistment Process 2018 – 19'. 2. To enlist application, pick the tab 'Snap here for New Registration' and enter Name, Contact points of interest and Email-id. A Provisional Registration Number and Password will be created by the framework and showed on the screen. Applicant should note down the Provisional Registration Number and Password. An Email and SMS showing the Temporary Registration number and Password will likewise be sent. 3. The Name of the hopeful or his/her Father/Spouse/Mother and so forth ought to be spelt effectively in the application as it shows up in the Certificates/Mark sheets/Identity confirmation. Any change/modification found may preclude the candidature. 4. Hopefuls can continue to transfer Photo and Signature according to the details given in the Guidelines for Scanning and Upload of Photograph and Signature. 5. Hopefuls can continue to fill different points of interest of the Application Form. 6. Approve your points of interest and Save your application by tapping the 'Approve your subtle elements' and 'Spare and Next' catch on each page. 7. On the off chance that the competitor can't finish the application shape in one go, he/she can spare the information as of now entered by picking 'Spare AND NEXT' tab. Preceding accommodation of the online application competitors is encouraged to utilize the 'Spare AND NEXT' office to confirm the subtle elements in the online application frame and adjust the same if required. Outwardly Disabled competitors should fill the application frame precisely and confirm/get the points of interest checked to guarantee that the same is right before definite accommodation. 8. Tap on the Preview Tab to review and confirm the whole application frame before FINAL SUBMIT. 10. Competitors are encouraged to precisely fill and check the subtle elements filled in the on the web application themselves as no change will be conceivable/engaged subsequent to tapping the 'Last SUBMIT' catch. 11. Tap on 'Installment' Tab and continue for installment.